It's Design Team Tuesday again at The Memory Nest. 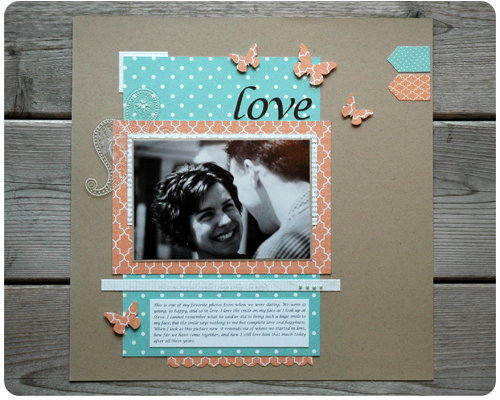 The paper we were asked to create with this week was Tell Your Story by Teresa Collins. The name of this paper line - Tell Your Story - made me think of some pictures I have from when Steve and I were dating, way back at the beginning of our story. So I looked through those pictures and settled on this one (one of my favorites) for this page. I cut my title (font: Monotype Corsivia) and the small butterflies out using my Silhouette. 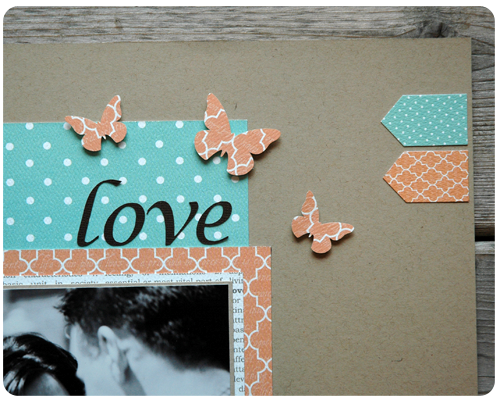 To add some dimension I attached the butterflies to my page using adhesive squares. Under this corner of my photo I slid a clear paisley embellishment from My Mind's Eye. 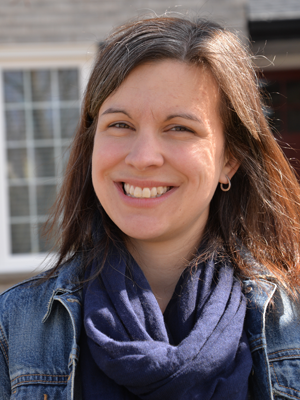 Two funny things about this layout: when Claire saw this picture of me she was absolutely shocked that I had short hair, and Bridget thought this picture had been taken "a long time ago when you could only take pictures in black and white". Funny kids. 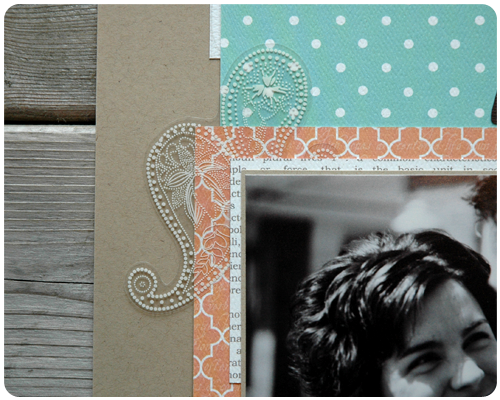 Tell Your Story is a lovely paper line - beautiful colors, lovely patterns. And the paper is a nice weight, a little heavier than other patterned papers, with a slight texture to it. Head on over to The Memory Nest today to see what the other incredibly crafty ladies on the Design Team have created - lovely and inspiring stuff. Just wanted to let you know that I love your layout. These papers look amazing on a kraft base. Thanks Jessica. I have been using Kraft paper a lot lately...it is an awesome neutral! Thanks for reading. What a pretty layout! I have just gotten into digital scrapbooking myself, and love it!! Thanks Emily. This is one of my favorite layouts that I have done lately. 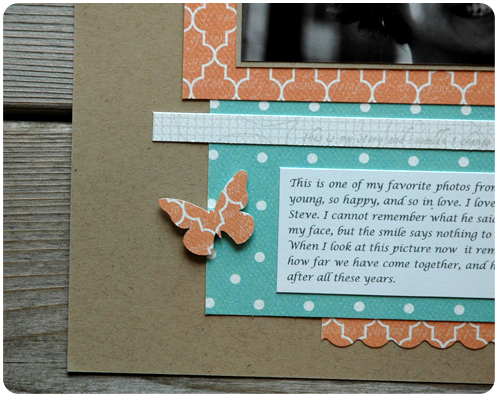 I am happy to hear that you are enjoying your new hobby - scrapbooking is so awesome! Thank you. I have been obsessed with kraft paper lately. It is such an awesome neutral, working well with so many color pallets. Thanks for stopping by. This is s pretty! Love the colors and that picture is beautiful! My students said the same thing about a black and white picture of our wedding day that I had on my desk. "Were all pictures back and white back then?" It was 2010!!!!!! Haha! Thanks Becky. I'm glad to hear that I am not alone and that you too got asked about a black and white picture taken 'back then'. Too funny!